It seems there are ports of that app for Mac available using Fink or Ports. But I found it's a hell to install them... it depends on a lot of things which depends on other things which... etc. iTerm 2 claims to be able to do this. I'm not sure what's going on with you and macports, but I just installed tmux using macports. it took about 30 seconds, and was completely painless. FWIW, I've subsequently spent enough time with GNU screen that I basically just use it for everything at this point. 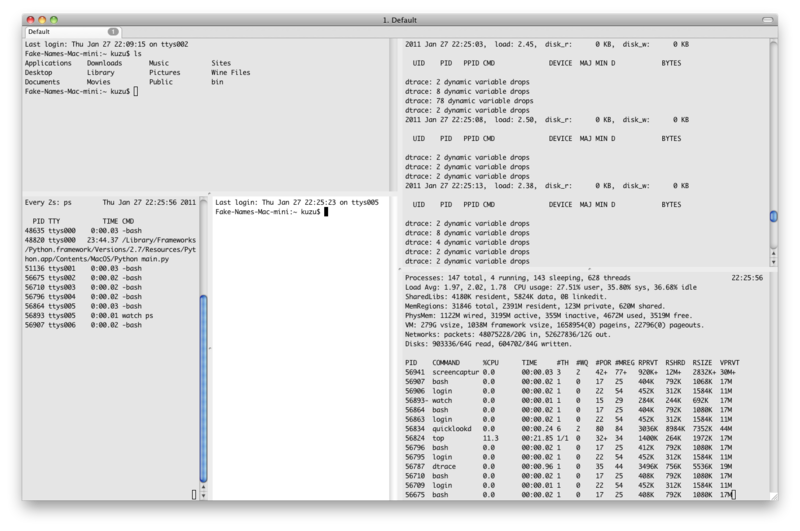 iTerm is nice if you want a local, mouse-driven multiplexer, but almost everything I do is server-side at this point, and doing it all over one SSH connection is much better anyways. Terminator was just ported to Mac OS X via the homebrew package Manager. See the PR or the recipe. Tested on OS X 10.9.2 the main functionalities work. 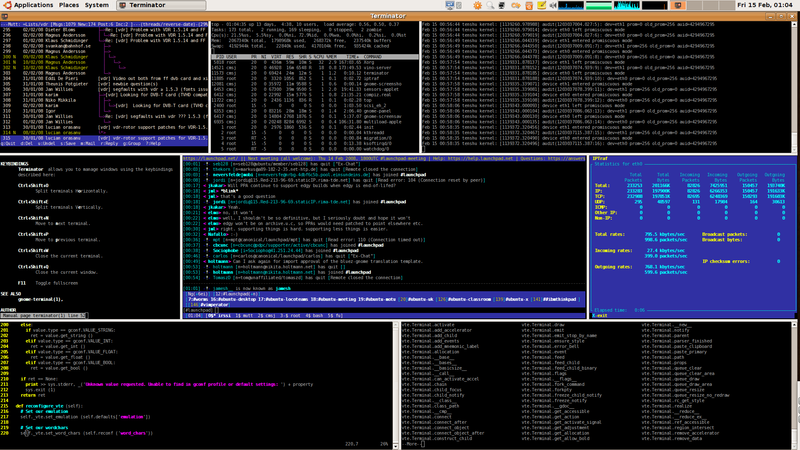 Install GNU Screen, or TMUX via macports/homebrew or by compiling it by hand. I think iTerm 2 and TotalTerminal are all great tools to improve the efficiency when working on terminal and command lines. I'm a big fan of SizeUp which lets you tile windows using keyboard commands. This doesn't put different views in one terminal, but it does let me easily have a bunch of views open at once and organized neatly. I found that GNU screen does exactly what I want (just type screen in terminal), but only after I spent a few minutes learning some basics. Here is the jump start I needed on key bindings (straight from the man page) - note that you need to install the GNU version for vertical splits (listed after the FAU version that was in my Mavericks). C-a '       (select)      Prompt for a window name or number to switch to. C-a -       (select -)    Switch to window number 0 - 9, or to the blank window. C-a tab     (focus)       Switch the input focus to the next region. See also split, remove, only. you use the option "-e]x", this command becomes "]]". C-a S       (split)       Split the current region into two new ones. C-a ? (help)        Show key bindings. C-a \       (quit)        Kill all windows and terminate screen. C-a *       (displays)    Show a listing of all currently attached displays. C-a |       (split -v)    Split the current region vertically into two new ones. Note: I tried searching the web for this, but words such as 'screen', 'terminal', and 'split' are so common as to make the man pages easier for me. For macOS 10.12 cssh from https://www.macports.org works great, whereas the homebrew version fails.